So you may not have seen us on in the last week, even though we had just been back for not even a week before leaving again. That is because we were gone, visiting Hades' mother. You see, he received pretty bad news that she had cancer and obviously, we wanted to be there with her as she was going through this hard time. Real life always comes first, I say. That was very stressful, since we had to find a sitter for one of our dogs, Captain, while we had to take the other, Bruce, with us on our 10+ hour road trip. It was exhausting, especially for Hades, who drove most of the way, powered by Monsters and soda. It was nice seeing his family again, since he only got to see her for a couple weeks out of the three years we were in Hawaii. Thankfully, she is now cancer free after her surgery and she is feeling awesome! That is a huge load off our backs and even though we had to make that 10+ hour road trip again after a long day visiting friends and the aquarium, it was a nice trip. Now we are back and hopefully we are going to be much more active, as long as real life doesn't poke its head into our business. We left the guild in great hands and it was amazing coming back and seeing this! I really wish I could have been there for the Siege War but I'm very proud of my guild for being so amazing! 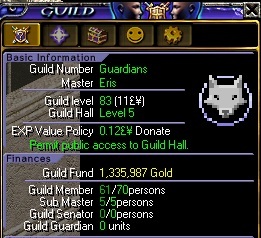 For now, I am probably going to leave the guild with Eris until we are sure that there are no other major hiccups that would cause us to leave suddenly, so if you need anything that only a GM can do, just message him! Besides that, it's just back to grinding and hoping life gets back to normal! Good luck and happy hunting! Finally got internet yesterday. We have been on the East Coast for approximately 2 weeks and it has been quite the change! I am liking where we ended up, since there are a ton of trails for our two dogs. Unfortunately, I am the most accident prone person I know and on our very first night in the East Coast, I broke my toe. So currently in a lot of pain and our apartment we got is on the 3rd floor of a building with no elevator. Thankfully, we do have internet again, so hopefully you will see us on more, since I have nothing better to do at the moment since my toe feels like knives are being driven into it. Other than that, nothing much to update since this is our first day being back in game. Expect more as time goes on and hope you all are having a fantastic beginning to your week!